This evening we enjoyed a "fast food" meal, and not the kind of fast food that has a drive-thru window, either. This is one of my favorite quick meals. I use Aidell's Smoked Chicken Sausage (they are nitrate and nitrite free) and vary the flavors I use. This evening I used their Chicken & Apple sausages, but I've used their other flavors as well, and they are all good. Since they are already cooked,, I simply slice them diagonally and brown them for a few minutes. I par-cook the trimmed and halved brussels sprouts by steaming them briefly in the microwave and then finish cooking them by stir-frying in a wok or large nonstick skillet. The wok is probably my preferred vessel to cook this dish because I can get a little wild when I toss them around and not fling them all over the stove like sometimes happens when I use my skillet instead...LOL. I snapped a couple of photos below and included my easy peasy recipe. 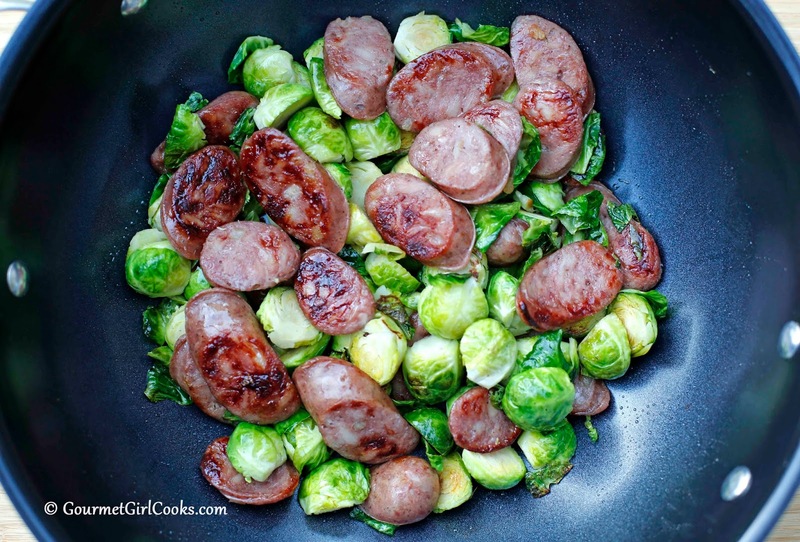 You can swap out whatever your favorite sausage is or toss in some shredded red cabbage as well for one of the most colorful dishes. This meal uses only 3 ingredients, including the butter and takes 15 to 20 minutes total to prepare which includes slicing the sausage and the sprouts. Enjoy! 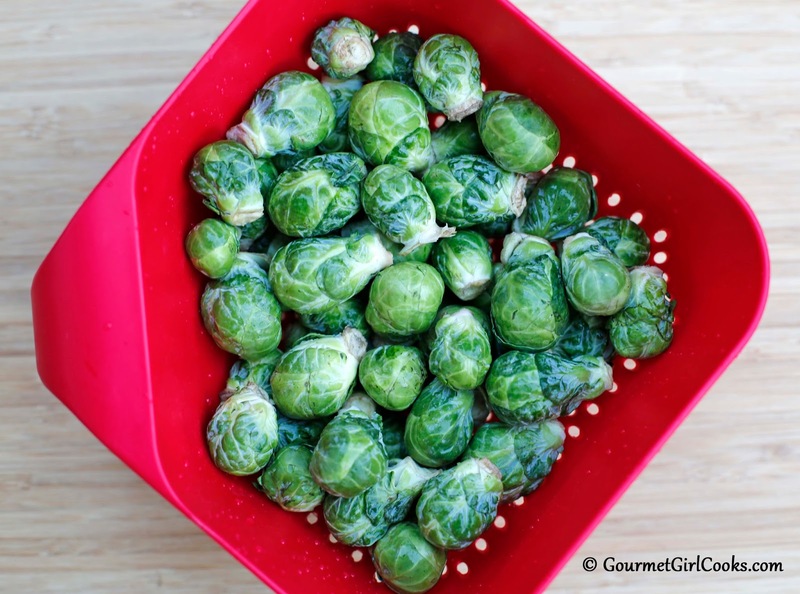 Place brussels sprouts in a covered glass Pyrex-type casserole dish with just the water and dampness left clinging to them after rinsing (about 1 teaspoon). Cover and microwave on high for about 3 minutes until slightly softened and still bright green. While sprouts are cooking, heat 1 tablespoon butter in a large wok or non-stick skillet over medium heat. Add sliced sausage and cook for 2-3 minutes per side until browned. 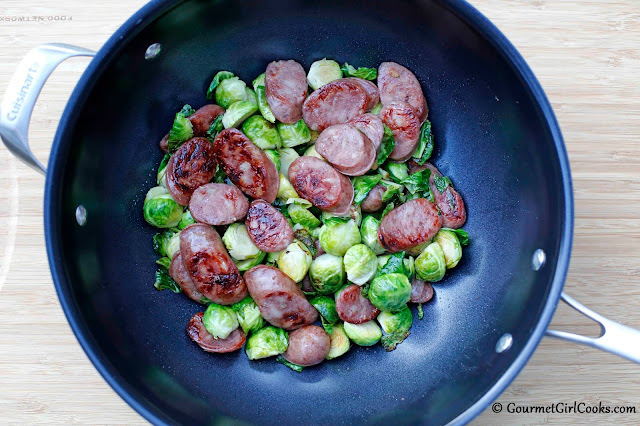 Transfer browned sausage to a bowl and set aside. Add additional tablespoon of butter to the wok or skillet; add steamed sprouts (drained) and stir fry over medium-high heat for about 5 minutes until browned and tender-crisp. Return sausage to skillet; add remaining tablespoon of butter and toss until coated and heated through. If desired, season with salt and pepper, to taste.